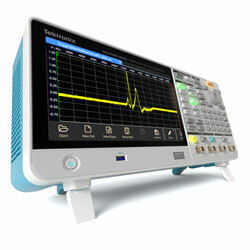 RS Components has launched a range of innovative, high-performance AFGs from Tektronix. With realtime waveform monitoring, programmable waveform sequencing, built-in waveform creation and, what is claimed to be the largest touch sensitive AFG screen on the market, the company intends its AFG31000 series to redefine the AFG concept for researchers and production engineers who want to generate test signals easily and quickly. The series has an industry-leading 9″ capacitive touchscreen that enables users to zoom in on areas of a waveform in unprecedented detail. All related settings and parameters can be viewed on a single screen by a shallow menu tree. An intuitive user interface enables users to tap or swipe to browse, locate, select and edit settings, cutting the time needed to learn and operate the AFG. The series has a new patented feature known as InstaView, intended to remove impedance mismatch problems. Conventional AFGs assume they are driving a 50Ohm impedance, but few DUTs truly have that impedance, leading to inconsistencies between the waveform set on the AFG and the signal at the DUT. InstaView addresses this dilemma by monitoring the waveform at the DUT on the AFG, enabling waveform verification with no need for additional cables or instruments. The waveform display responds to changes in amplitude, frequency, waveform shape and DUT impedance in real time. Another new feature built into the series is the ArbBuilder tool, which allows users to create and edit arbitrary waveforms directly on the AFG, using templates and an equation editor, rather than having to build them on a PC and transfer them over. Alternatively, waveforms obtained by an oscilloscope can be saved as .csv files and loaded directly into the AFG using ArbBuilder.